Prominent & Leading Wholesale Trader from Mumbai, we offer conductivity tds salinity handheld meters. 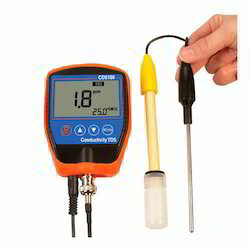 In our extensive product range, we make avail superior quality Conductivity / TDS / Salinity Handheld Meters. Available in varied specifications and with Cell Constant of K = 1.0, these cost effective products are effective in testing liquids and fluids for purity. Also, we ensure that these are manufactured using superior quality components and as per international quality standards. Looking for Conductivity - TDS - Salinity Handheld Meters ?